Atlantic Station is a new development near the core of Atlanta being built on disused railroad tracks. It combines residential, housing and retail uses and, among proponents of the New Urbanist movement and is often held up as a model for developments to come. 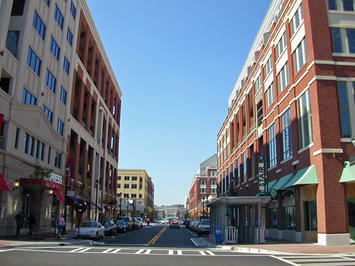 Atlantic Station is traditionally urban but is surprisingly suburban. On the surface, Atlantic Station appears to fit many of the New Urbanist design criteria. The buildings start at the sidewalk (pavement) line, rather than being behind parking lots. There are no indoor shopping malls. Instead the stores are directly on the streets, reminiscent of old downtowns or the first shopping centers, like Country Club in Kansas City. Some of the normally superficial New Urbanism, however, is even more ephemeral in Atlantic Station. For one thing, prime New Urbanist lynchpins --- anti-automobile design, pedestrian orientation, transit orientation, paid parking, banning of big box stores --- do not apply there. Throughout the development there are entrances at the sidewalk level that look like New York subway entrances. As in New York, they go down. But they don’t go down to a subway --- that’s well beyond walking distance, across one of the nation’s widest freeways in Midtown. Instead, the stairs --- at least 16 such entrances --- lead down to a three-story parking lot that appears to be under the entire development. Houston could not have done it bigger or better. The architects did not design Atlantic Station from the ground up --- they designed it with three levels of parking under the stores, residences and streets. Thus, this “pedestrian oriented development” sits on a foundation of automobile orientation. And don’t think that the parking lots are only below the surface. Virtually all of the tall office and residential towers have a number of floors above the parking lot platform, though to the credit of the architects, they are not obvious. Another rather suburban feature is free parking. A staple of current urban planning is that parking should not be free. The opponents of free parking believe that if only free parking were outlawed, people would flock to inner cities and transit. And to be sure, the little street parking provided in Atlantic Station is metered, which means people must pay. But on all of the parking meters there are signs to the effect that two hours of free parking are offered in the underground lots. As would be expected in a development theoretically designed for pedestrians, the sidewalks are sufficiently wide. Indeed, the sidewalk on the 17th Street overpass from Midtown to Atlantic Station is more than 30 feet wide (perhaps 10 meters). Yet it is a lonely place and ultimate proof that if you build sometimes they don’t come. There is another pedestrian oriented dimension in which Atlantic Station fails --- for all the sidewalks and sidewalk store entrances, Atlantic Station provides a free shuttle bus for travel around the development. Toward the west side of the development is a “Millennium Gate,” which the Atlantic Station calls “Atlanta’s greatest monument.” This seems a bit hyberbolic. Millennium Gate is an imitation of the Arch d’ Triumph in Paris, even to the point of Latin inscriptions around the top. One doesn’t need the American flag hanging from the center to realize that this miniature imitation fails abjectly --- it is reminiscent of the Paris Arch d’ Triumph no more than the pathetic Eiffel Tower is on the Las Vegas Strip. Something original would have been more appropriate. Then there is the general new urbanist problem with affordability. The lowest priced apartments in Atlantic Station rent for $1,100 per month, at least one-quarter above the median rent for the Atlanta metropolitan area. The lowest priced two bedroom residences appear to sell for at least 2.5 times the median house price in the area, except that the median house is almost four bedrooms. For all this, Atlantic Station is rather full of itself as visionary, noting that people can reduce their journey to work time by living and working there. The Atlantic Station website notes that “Atlantans spend more time commuting to work than most anywhere in the world.” In reality, Atlantans spend less time commuting than most people who live in large urban areas outside the United States. True, Atlantans spend more time commuting than most people in the United States and that is to be expected with what is close to N underpowered freeway and arterial street system. What sets Atlanta’s Atlantic Station off is not so much its unique design as the abandonment of old freight rail yards near the center of Atlanta that allowed it to be developed. The same kind of disuse made Portland’s Pearl District possible, and an abandoned airport made Denver’s Stapleton possible. They are all attractive, in my view, but with an important caveat: such developments cannot be replicated without using large swaths of abandoned land, which is not readily available or through massive condemnation (takings), which only the city of Portland’s radical political machine seems to be insensitive enough to do. Yet I would not suggest that Atlantic Station is simply faux New Urbanism. There are some legitimate New Urbanist touches. Although the development sprawls significantly, the housing elements are rather dense --- and as in many New Urbanist efforts --- also well-subsidized. Further, Atlantic Station appears to be urban on a much larger scale than other developments. Its buildings are much larger than in Portland’s Pearl District and its retailing more intense. But that is to be expected in Atlanta, which, in my view achieved world class status some time ago. In a sense, Atlantic Station may well reflect one aspect of the urban future in our newer cities. It remains fundamentally auto-oriented (note all that parking) and full largely of suburban-like chain shops. This may seem a somewhat contrived notion of urbanism, but at its core one that accommodates modernity. Atlantic Station does it largely by bringing the comforts of suburban living to the center city. 16th Street, which I live off of serves as an offramp of I-75, turning it into a highway made for commuters wishing to get to 17th Street. Even within the development, land use is segregated. Outside of the District, everything else is residential, except Target and Ikea. Requiring the use of the Shuttle Bus, which is an experience all of it's own. Also to be noted, the construction is horrible. Period. The ATL Lofts were uninhabitable for 6 months and many facades around the development have to be re-done. To the south in Home Park, many streets leading into Atlantic Station are having their small bungalows torn down and replaced by McMansions. It's not just the size, but the pure architectural integrity doesn't match that of the neigborhood. I truly believe that once light rail comes, which it is designated to go on 17th Street, Atlantic Station will become more urban and less suburban. And the Arch D'Ikea........Only in America. PS. If you really want to experience New Urbanism in Atlanta check out Glenwood Park in East Atlanta. Now that's a place you can write home about. Submitted by natrius on Fri, 09/19/2008 - 13:18. I don't understand how you can characterize affordability as a general problem with new urbanism. First of all, most new urbanist developments typically offer higher end housing. There is more money to be made in luxury housing, so if the demand has not been met for high density luxury housing, that is what you will see in new urbanist developments until it is met. If new urbanist developments weren't prohibited by zoning in most areas, you would see more of them and their prices would go down due to increased supply as well as new developments aimed towards the middle of the market.